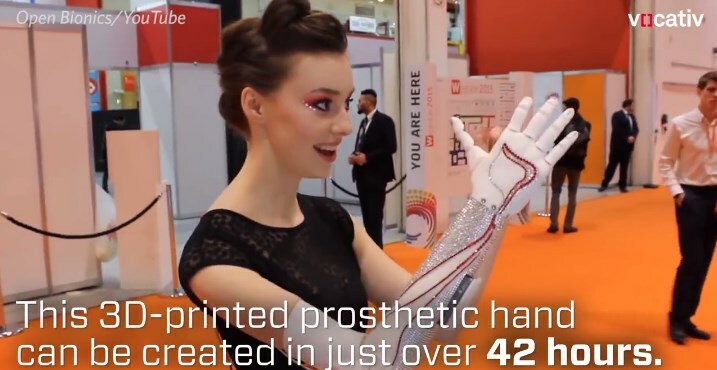 The Future Is Now: See The First 3D PRINTED PROSTHETIC HAND! Minor accidents teach us valuable lessons and they may change the way we see the world. However, if a major accident occur, it can be a complete life changer. For instance, a loss of limb can simply devastate any human being. On the other hand, there are people born this way, and they probably are used to live a life without a limb but that does not mean that they have to spend the rest of their lives hoping for a solution. In fact, the solution for the people who miss a hand is finally here with this 3D PRINTED PROSTHETIC HAND! It is a word of the 3D printed prosthetic hand created by Open Bionics! This team has recently won the James Dyson Award, a reputable UK award. Anyway, this devices can be 3D printed in less than two days, meaning that it saves a lot of time and money too! The estimated price would be something above $3000. Every prosthetic hand is custom made i.e. the user`s hand is scanned then the hand is printed. Furthermore, the hand moves with the help of sensors which are attached on the user`s skin and they collect muscle movements thus controlling the hand. Hope that we are going to see this product on the market the following year! At last, click here to read more about the latest advance in 3D printing: the first 3D printed replacement teeth! This technology is definitely becoming more advanced!